If you haven't yet been to Chatroulette, here's the premise: Anyone with a webcam goes to the site and clicks "play." The site finds a random person to chat with -- also with webcam. You never know what you'll find (although if you've tried it, you know the ratio is pretty much 30 men to each woman, and that you're as likely to see man junk as ... anything else). Either person chatting can quickly click "next" and find another random person with which to chat. Generally, I think, the site is a) worthless and b) schizo. Chatters don't stick around long and there are many, many landmines. However, I stuck it out for about an hour the other night with Riviera helping me quickly convey that I was interested in genuine (random) chatting. 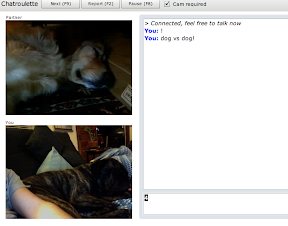 The screenshot above shows when we found another webcam that was focused on a fluffy dog. I started all my chats with the camera pointed at Riviera and tried to initiate genuine conversations. Ultimately I made a penpal friend from Puerto Rico. I also met a college kid in Utah, a gritty fella from Lisbon, and at least three other dogs! This is no endorsement, but I think chatroulette is at least a one-time adventure worth trying. You never know, you could run into Snoop Dog. My brother had to do some Chatroulette exploring for a research project. He ran into the cat man. This whole concept sort of freaks me out a bit.